"This is not a black problem," said junior Opeyemi Owoeye. "This is a problem for everybody"
University of Maryland students held a sit-in Tuesday to protest a Ferguson grand jury's decision not to indict Officer Darren Wilson in the fatal shooting of 18-year-old Michael Brown. Calling the demonstration #OccupyStamp on social media, student protesters gathered at Adele H. Stamp Student Union, where they linked arms, conducted chants and held a moment of silence for Brown lasting four and a half minutes. "This is not a black problem," said junior Opeyemi Owoeye. "This is a problem for everybody." Owoeye, a government and politics major, helped lead the protests that drew hundreds of students. "We're angry, but more than angry, we're fearful," she said, "because this could become the next Ferguson." 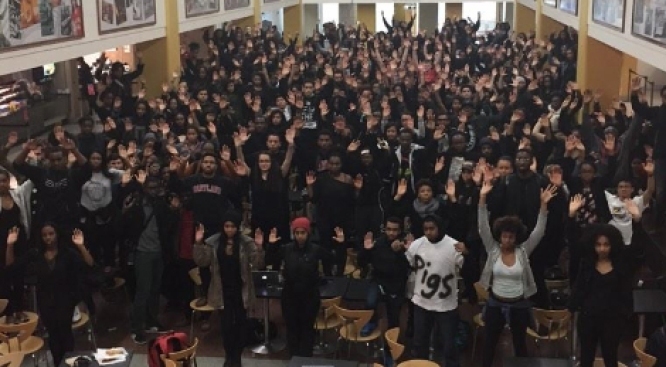 The students joined arms to show solidarity, chanting, "Hands up, don't shoot!" Organizers said they were pleased to see so many students of different races and ethnicities participating. "The one thing we have in common is we are all striving for justice," said student Jasmine Whittington. There was a police presence in the student union, but no arrests. Students prayed, sang, and lined up to individually express their feelings about the Brown shooting and the grand jury's decision. "They blamed Twitter, the media, and everyone but Darren Wilson," said one student. Student Aziz Sani shared his poem "American Horror Story," while Owoeye became emotional as she read the names and stories of black men who were killed by police. They were quiet for four and a half minutes to represent the four and half hours Brown's body was in the street. One student lay on the ground to represent the unarmed teen. "It's about the two-tiered legal system in our country, that there's such a disparity of justice, and people feel like they're not playing with a fair deck of cards," said another student.